Timberland wishing you & your family a happy holiday. 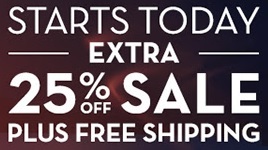 So, enjoy an extra 25% discount on your entire online purchase. Plus, take an advantage of free shipping on all orders. The offer is valid online only. Source of the information is Timberland. Offer is valid through 12/31/2015. More details available at stores. (total: 890)G.H. Bass & Co.